I suspect the difference is because the real PR9 had a longer fuselage than the bomber versions, and the RB-57F was based on the earlier B2, which was shorter. Here's the 'PR9' with the PR9 camera bay added. LOTS of PSR was required, Airfix and Mach 2 not really agreeing on the shape of the Canberra's underside. Lots more PSR tomorrow I suspect. Hehehe, hysterical laughter here Alastair. Nice one. 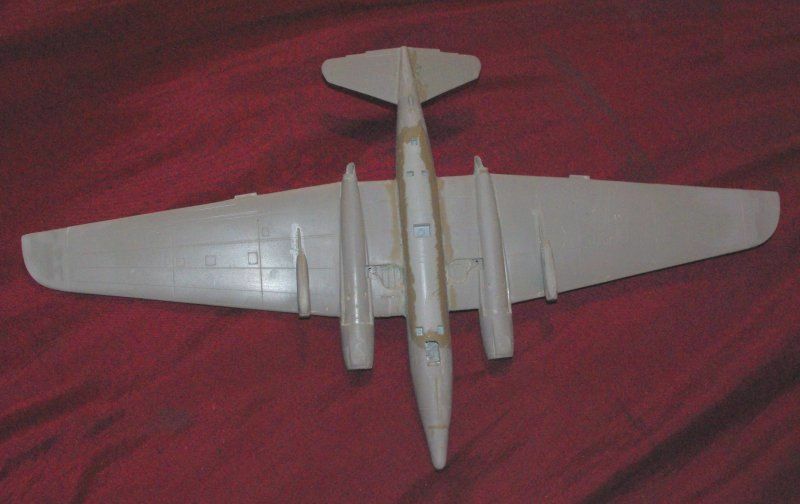 Is this the secret replacement for the RAF's few Meteor PR19s? By the time the RAF wanted a new, larger PR platform the existing PR19s had dwindled down to only a squadron's worth. You know one can not imagine ANY PR-19 ever dwindling. The backstory says they did, until there was only one in fact. Well there you are, they have never dwindled out! and we know where it ended up. At least it was in good company there! When were they re-engined with the RB211-666, based on the - 535, with the 74” fan? The slightly less than 90” fan casing certainly had a dramatic appearance. Finally got the end of the initial PSR session and it was time for the first primer coat. Half way through that I ran out of paint! I thought I had a spare can but it turned out to be Ford Polar Grey, and gloss at that. I did find a can of Halfords Plastic Primer, just standing on its own, so I tried that. Now I know WHY it was standing on its own, its useless for plastic kits! The spray pattern is far too coarse and speckley and the nozzles are not interchangeable with the standard grey primer! Nice marketing Halfords, NOT! Guess where I'll be off to in the morning? The 'PR9's got it's underside colour applied now, Light Aircraft Grey all over. There's an AWFUL lot of wing there to paint though! I've also painted the cockpit interior too, all over black at the moment, but I'll trim it up a bit later. I've managed to lose both mainwheels, which is a pain, but I've got some ex-M'box PR9s ones knocking about somewhere. You're really going for the gusto in this GB! Another fantastic project for me to watch. similar primers from other makers the DuPlo one is, oddly enough, transparent. Yes, of course it is, but the non-interchangeability of the nozzles just doesn't make sense.